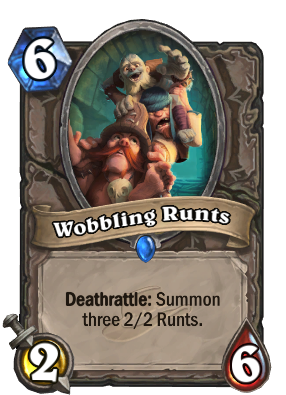 Deathrattle: Summon three 2/2 Runts. The fourth one fell off in a tragic accident. They don't talk about it. 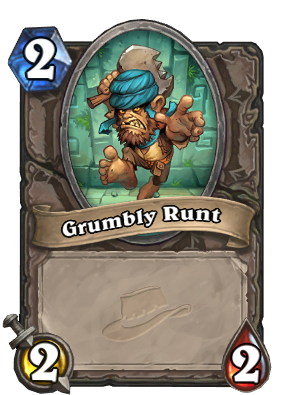 I don't get why would Blizz release such a blatantly imbalanced card. Boulderfist Ogre trades 1 for 1 with this card and its a neutral. It also doesn't get ignored if you drop it on turn 6. No, you cant, or at least very hard, to deal 12dam in one turn. If this thing happen, maybe you already lose the game. 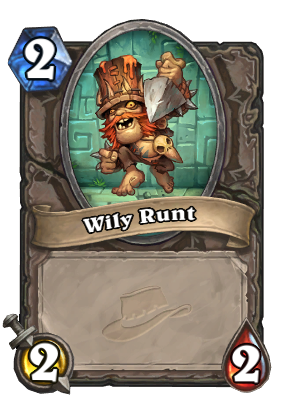 And like youve said, this card can trade 1 1 with boulderfist ogre, that mean its stat is not bad. I would compare it to haunted creeper, since both have low stat and same ability. The one in the front looks like Lemmy. Anyone? This is always one of the three options when I play Museum Curator. Is that intentional? Regardless, I almost always pick it out of the three because the others don't do much for me in the match. it's working very well in my Rattle Rogue. "Let me change your mind"
And I thought I was the only one who still remembered AoE. Debatable, but fair. Savannah is a Class Card, after all. you might run both in some version of feign death hunter. But honestly Savannah Highmane is a little too good. If it was a neutral card every control would play it. This guy confirm working for the Cabal.